Monomers form the basis of macromolecules that sustain life and provide manmade materials. Monomers group together to form long chains of macromolecules called polymers. Various reactions lead to polymerization, usually via catalysts. Numerous examples of monomers exist in nature or are used in industries to create new macromolecules. Monomers are small, single molecules. When combined with other monomers via chemical bonds, they make polymers. Polymers exist both in nature, such as in proteins, or they can be manmade, such as in plastics. Monomers present as small molecules. They form the basis of larger molecules via chemical bonds. When these units are joined in repetition, a polymer is formed. Scientist Hermann Staudinger discovered that monomers make up polymers. Life on Earth depends on the bonds monomers make to other monomers. Monomers can be artificially constructed into polymers, which consequently join with other molecules in the process called polymerization. People harness this capability to make plastics and other manmade polymers. Monomers also become natural polymers that make up the living organisms in the world. Among the monomers in the natural world are simple sugars, fatty acids, nucleotides and amino acids. Monomers in nature bond together to form other compounds. Food in the forms of carbohydrates, proteins and fats derives from the linkage of several monomers. Other monomers can form gases; for example, methylene (CH2) can bond together to form ethylene, a gas found in nature and responsible for ripening fruit. Ethylene in turn serves as a base monomer for other compounds such as ethanol. Both plants and organisms make natural polymers. Polymers found in nature are made from monomers that feature carbon, which bonds readily with other molecules. Methods used in nature to create polymers include dehydration synthesis, which joins molecules together yet results in the removal of a water molecule. Hydrolysis, on the other hand, represents a method of breaking polymers down into monomers. This occurs via breaking bonds between monomers via enzymes and adding water. Enzymes work as catalysts to speed up chemical reactions and are themselves large molecules. An example of an enzyme used to break a polymer into a monomer is amylase, which converts starch to sugar. This process is used in digestion. People also use natural polymers for emulsification, thickening and stabilizing food and medicine. Some additional examples of natural polymers include collagen, keratin, DNA, rubber and wool, among others. Simple sugars are monomers called monosaccharides. Monosaccharides contain carbon, hydrogen, and oxygen molecules. These monomers can form long chains that make up polymers known as carbohydrates, the energy-storing molecules found in food. Glucose is a monomer with the formula C6H12O6, meaning it has six carbons, twelve hydrogens and six oxygens in its base form. Glucose is made chiefly via photosynthesis in plants and is the ultimate fuel for animals. Cells use glucose for cellular respiration. Glucose forms the basis of many carbohydrates. Other simple sugars include galactose and fructose, and these also bear the same chemical formula but are structurally different isomers. The pentoses are simple sugars such as ribose, arabinose and xylose. Combining the sugar monomers creates disaccharides (made from two sugars) or larger polymers called polysaccharides. For example, sucrose (table sugar) is a disaccharide that derives from adding two monomers, glucose and fructose. Other disaccharides include lactose (sugar in milk) and maltose (a byproduct of cellulose). An enormous polysaccharide made from many monomers, starch serves as the chief storage of energy for plants, and it cannot be dissolved in water. Starch is made from a huge number of glucose molecules as its base monomer. Starch makes up seeds, grains and many other foods that people and animals consume. The protein amylase works to revert starch back into the base monomer glucose. Glycogen is a polysaccharide used by animals for energy storage. Similar to starch, glycogen’s base monomer is glucose. Glycogen differs from starch by having more branches. When cells need energy, glycogen can be broken down via hydrolysis back into glucose. Long chains of glucose monomers also make up cellulose, a linear, flexible polysaccharide found around the world as a structural component in plants. Cellulose houses at least half of Earth’s carbon. Many animals cannot fully digest cellulose, with the exception of ruminants and termites. Another example of a polysaccharide, the more brittle macromolecule chitin, forges the shells of many animals such as insects and crustaceans. Simple sugar monomers such as glucose therefore form the basis of living organisms and yield energy for their survival. Fats are a type of lipids, polymers that are hydrophobic (water repellent). The base monomer for fats is the alcohol glycerol, which contains three carbons with hydroxyl groups combined with fatty acids. Fats yield twice as much energy as the simple sugar, glucose. For this reason fats serve as a kind of energy storage for animals. Fats with two fatty acids and one glycerol are called diacylglycerols, or phospholipids. Lipids with three fatty acid tails and one glycerol are called triacylglycerols, the fats and oils. Fats also provide insulation for the body and the nerves within it as well as plasma membranes in cells. An amino acid is a subunit of protein, a polymer found throughout nature. An amino acid is therefore the monomer of protein. A basic amino acid is made from a glucose molecule with an amine group (NH3), a carboxyl group (COOH), and an R-group (side chain). 20 amino acids exist and are used in various combinations to make proteins. Proteins provide numerous functions for living organisms. Several amino acid monomers join via peptide (covalent) bonds to form a protein. Two bonded amino acids make up a dipeptide. Three amino acids joined make up a tripeptide, and four amino acids make up a tetrapeptide. With this convention, proteins with over four amino acids also bear the name polypeptides. Of these 20 amino acids, the base monomers include glucose with carboxyl and amine groups. Glucose can therefore also be called a monomer of protein. The amino acids form chains as a primary structure, and additional secondary forms occur with hydrogen bonds leading to alpha helices and beta pleated sheets. Folding of amino acids leads to active proteins in the tertiary structure. Additional folding and bending yields stable, complex quaternary structures such as collagen. Collagen provides structural foundations for animals. The protein keratin provides animals with skin and hair and feathers. Proteins also serve as catalysts for reactions in living organisms; these are called enzymes. Proteins serve as communicators and movers of material between cells. For example, the protein actin plays the role of transporter for most organisms. The varying three-dimensional structures of proteins lead to their respective functions. Changing the protein structure leads directly to a change in protein function. Proteins are made according to instructions from a cell’s genes. A protein’s interactions and variety are determined by its basic monomer of protein, glucose-based amino acids. Nucleotides serve as the blueprint for the construction of amino acids, which in turn comprise proteins. Nucleotides store information and transfer energy for organisms. Nucleotides are the monomers of natural, linear polymer nucleic acids such as deoxyribonucleic acid (DNA) and ribonucleic acid (RNA). DNA and RNA carry the genetic code of an organism. Nucleotide monomers are made of a five-carbon sugar, a phosphate and a nitrogenous base. Bases include adenine and guanine, which are derived from purine; and cytosine and thymine (for DNA) or uracil (for RNA), derived from pyrimidine. The combined sugar and nitrogenous base yield different functions. Nucleotides form the basis for many molecules needed for life. One example is adenosine triphosphate (ATP), the chief delivery system of energy for organisms. Adenine, ribose and three phosphate groups make up ATP molecules. Phosphodiester linkages connect the sugars of nucleic acids together. These linkages possess negative charges and yield a stable macromolecule for storing genetic information. RNA, which contains the sugar ribose and adenine, guanine, cytosine and uracil, works in various methods inside cells. RNA serves as an enzyme and assists DNA replication, as well as making proteins. RNA exists in a single-helix form. DNA is the more stable molecule, forming a double helix configuration, and is therefore the prevalent polynucleotide for cells. DNA contains the sugar deoxyribose and the four nitrogenous bases adenine, guanine, cytosine and thymine, which make up the nucleotide base of the molecule. The long length and stability of DNA allows for storage of tremendous amounts of information. Life on Earth owes its continuation to the nucleotide monomers that form the backbone of DNA and RNA, as well as the energy molecule ATP. Polymerization represents the creation of synthetic polymers via chemical reactions. When monomers are joined together as chains into manmade polymers, these substances become plastics. The monomers that make up polymers help determine the characteristics of the plastics they make. All polymerizations occur in a series of initiation, propagation and termination. Polymerization requires various methods for success, such as combinations of heat and pressure and the addition of catalysts. Polymerization also requires hydrogen to end a reaction. Different factors in the reactions influence the branching or chains of a polymer. Polymers may include a chain of the same kind of monomer, or they may include two or more kinds of monomers (co-polymers). "Addition polymerization" refers to monomers added together. "Condensation polymerization" refers to polymerization only using part of a monomer. The naming convention for bonded monomers with no loss of atoms is to add “poly” to the monomer name. Many new catalysts create new polymers for different materials. One of the basic monomers for making plastics is ethylene. This monomer bonds to itself or to many other molecules to form polymers. The monomer ethylene can be combined into a chain called polyethylene. Depending on the characteristics, these plastics can be High Density Polyethylene (HDPE) or Low Density Polyethylene (LDPE). 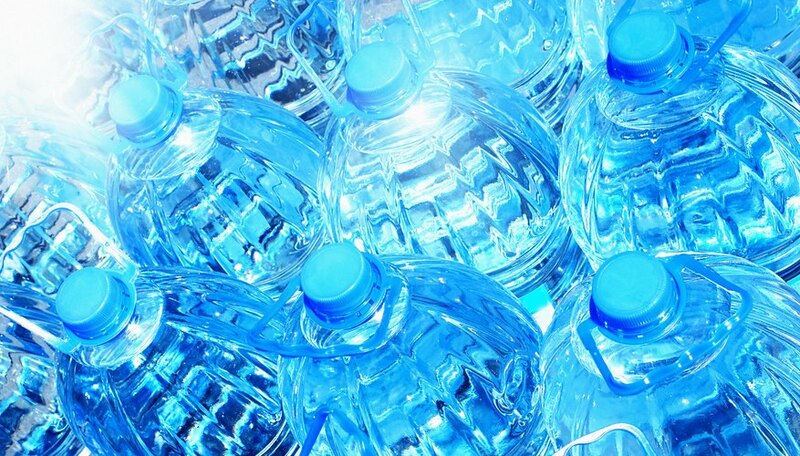 Two monomers, ethylene glycol and terephthaloyl, make the polymer poly(ethylene terephthalate) or PET, used in plastic bottles. The monomer propylene forms the polymer polypropylene via a catalyst that breaks its double bonds. Polypropylene (PP) is used for plastic food containers and chip bags. Vinyl alcohol monomers form the polymer poly(vinyl alcohol). This ingredient can be found in children’s putty. Polycarbonate monomers are made of aromatic rings separated by carbon. Polycarbonate is commonly used in glasses and music discs. Polystyrene, used in Styrofoam and insulation, is composed of polyethylene monomers with an aromatic ring substituted for a hydrogen atom. Poly(chloroethene), a.k.a poly(vinyl chloride) or PVC, is formed from several monomers of chloroethene. PVC makes up such important items as pipes and siding for buildings. Plastics provide endlessly useful materials for everyday items, such as car headlights, food containers, paint, pipes, fabric, medical equipment and more. Polymers made from repeating, linked monomers form the basis of much of what humans and other organisms encounter on Earth. Understanding the basic role of simple molecules like monomers yields greater insight into the complexity of the natural world. At the same time, such knowledge can lead to the construction of new polymers that could provide great benefit. Scientific American: How Are Polymers Made? Dianne, J.. "Types of Monomers." Sciencing, https://sciencing.com/types-monomers-8429865.html. 20 August 2018.